A remarkable new fossil discovery of amoeba-like micro-organisms that lived 570 million years ago could make scientists rethink some widely-accepted theories about how complex life on Earth first evolved from a single-celled universal common ancestor. An international team of researchers analyzed the rock-encased fossils in precise computer models created from high high-energy X-rays generated using a particle accelerator. The scientists say they were surprised when the results indicated the fossilized cell clusters were not animals or embryos. 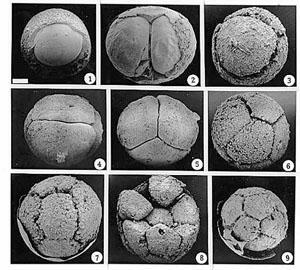 That is because it had long been thought that fossils showing this apparent pattern cell division represented the embryos of the earliest animals. The new study is published in the journal, Science. The microscopic fossils examined in the study were recovered from rocks collected in southern China. The scientists say the micro-organisms lived during the Ediacaran geologic period between 600 million and 543 million years ago when multi-celled life was just starting to evolve. Geologists say the Ediacaran period marks the end of the last ice age in a 250 million year-long series of glaciations that covered most of the planet and froze the oceans from pole to pole - a time commonly known as Snowball Earth. One theory proposed that climate shocks during the planet's Snowball Earth phase initiated the evolution of complex, multicellular life that emerged in the Ediacaran period.